Jesus said, “Then shall they deliver you up to be afflicted, and shall kill you: and ye shall be hated of all nations for my name’s sake” (see Matthew 24:9). We are living in a time where right is wrong and wrong is right. When up is down and down is up. To borrow a song title from The Temptations, our world is a “Ball of Confusion”. We the Church in America have been fighting a one front war when the enemies of soul and of our God have come after us on three fronts – politically, culturally, and yes, spiritually. What do I mean on three fronts? Where we elect (see choose) people for public office, we use every other kind of standard except the Word of God. Why? We are told to “Vote the Bible” – yet usually the only time you hear this is the Sunday before an election (which equates to 6 times every 12 years). So how do you vote with a book you don’t even know? I go into more of that in “Check the Lens, Not the Image”. Second, culturally it is accepted in this country to go to church, but is frowned upon and viewed with absolute hatred to BE the Church. Third, we are fighting a spiritual war, no question about it. I am very aware of Ephesians 6:12. However, ask yourself this question, “Which demonic entity is in public office today”? “Which principality makes public policy that you are protesting”? Yet we are being told to “Obey the laws of the land”. In essence, we are told to be Biblically correct, but don’t grow a political or cultural spine. I would suggest to every person who has ever mounted a pulpit to ask yourself, “What type of believer am I reproducing in my messages”? Make no mistake about it. We are a nation under judgment. The Church in America in general – its leadership in particular is directly responsible. True, we ALL need to repent. But after repentance, then what? The way I see it, for the survival of this country the Church has to mount up an offensive, culturally and politically. This is in addition to maintaining and advancing the spiritual front. If this means that current leadership is to be removed because of the inability or refusal to change, so be it. At the end of the day, it boils down to two choices: Either we embrace the world’s ways and become a target of God’s wrath, or we embrace the the cross and become the target of a rifleman’s crosshairs. Make no mistake about it; In this life, we are all targeted. Are You the Mop or the Mess? Being human we all make mistakes. But its not the mistakes we make that shows responsibility, it’s what we do with it. When we spill a drink on the floor, we have the choice of leaving it there for someone else to clean it up, or we can stoop down and clean it up ourselves. As it is with us domestically, it is no different politically. The Church in America have a created many messes. We have created the mess of ignorance in our pews to the point that you would be hard pressed to find 20% of any given congregation that can concisely explain what a Biblical worldview is. At the same time you would just as hard pressed to find less than 50% of the same congregation who could not tell you who was on American Idol last week. I go into more of that in “Who Should be the REAL American Idol”. It’s no wonder the world views us as “the Party of NO”, because we haven’t adequately explain what we say “Yes” to. To the “churched” person the obvious answers would be Jesus, the Bible, and prayer. Ask the average pew warmer how do those three things integrate into our society to make it better, they would be at complete loss for words. Whoops! Another mess! Why? The average pew warmer has been conditioned, “If I can get this person to church and have them hear my Pastor, they will understand what I mean”. Scripture specifically calls for you to give an answer to the hope that is within you (See I Peter 3:15). Not the hope within your Pastor. If anything, your Pastor should be the “echo” to your voice. Not the other way around. In order to be able to “clean this up” you must have a Biblical worldview in addition to a proper working knowledge of U.S. History. Primarily, what our Founding Fathers said, and how they thought. It is when we as believers do this, we will begin to take our country back. Back from the precipice of political oblivion. Back by pulling ourselves out the social and moral cesspool we have been immersed in for decades. We will see the truth as it is; thereby being able to walk in its marvelous light. The choice is overwhelmingly clear. You can lay there as the mess and hope that someone will clean you up, or you can be the mop and get busy! Do We Learn From History, or Do We Repeat It? 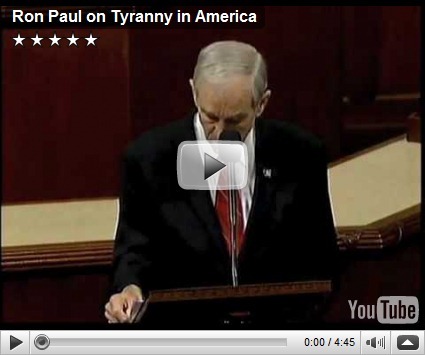 After watching this video, I am reminded of those who warned against Hitler, and how the population ignored him. Those who spoke against Lenin and Stalin, and how the population ignored them. These type of warnings can be traced throughout history. They can even be traced all the way back to the days of the Bible. Where righteous people who loved their countrymen and their country stood up and told the population, “Stop!” “Repent!” “Turn Back!” Sadly, the population did not listen. They did not listen in Noah’s day. They did not listen in John the Baptist’s day. I wrote an entry a few months back called “Pick A Side, The Lord Already Has” in which I warned the Church that this day was coming and that we must in essence check our government before the government checks us. We now we have a sitting U.S. Congressman in the Well of the House of Representatives stating that assassination plans for targeted American Citizens (see Christians and Conservatives and all others who speak against the evil in our government that we chose to elect) are underway. Yet we in the American Church still go on “business as usual”. Going to our churches on Sundays and Wednesdays to do our religious exercises. Coming out of the services “pumped”. Ready to take on the devil wherever he may hide. All the while the devil laughs, and relegates the threat of the American Church as terrifying as shooting fish in a barrel. Don’t get me wrong. God has His remnant. Two things about His remnant you must know is this: They don’t fit the stereotypical mold of what a “Christian” is. They also don’t fit the stereotypical mold of what a “Christian” does. In other words, they don’t look for a place of “revival”. The Holy Spirit already put that in them. They look for an opportunity to demonstrate it. Where the American Church continually miss it, is that the thought of revival only comes in a spiritual form in the way of evangelism of the unbeliever and repentance of the believer. Most of them don’t think that Kingdom comes through the transformation of our culture which influences our schools, our businesses, and yes our government. America is at a crossroads. Do we take the rocky road less traveled, and learn from history? Or do we stay stuck in our complacency, arrogant in our intelligence, and take the well worn road that those in history have taken. Thinking it will lead us to a great mountain of peace and truth. Not knowing that around the corner, the road abruptly ends and we fall off the cliff into a sea of chaos surrounded by the skeletons of people in history who chose not to listen also. The end result of their folly stands before us a graphic reminder not to make the same mistake.